Productivity is more important than ever. We have ever-increasing demands on our time. We are continually barraged with information through all types of media and devices. We need to manage both inputs and outputs. Naturally people turn to productivity and time management systems for relief. But the list of time management systems and tools is equally daunting. Unfortunately, there is no one-size-fits-all approach to productivity. Everyone must find their own tools. I focus on the specific tools and tips in part 3 of this series. Stephen Covey writes that time management is really personal management. Time management is managing yourself. It is self discipline. Certainly a simple concept, but one that’s very difficult to do. The first step is knowing your personal priorities. 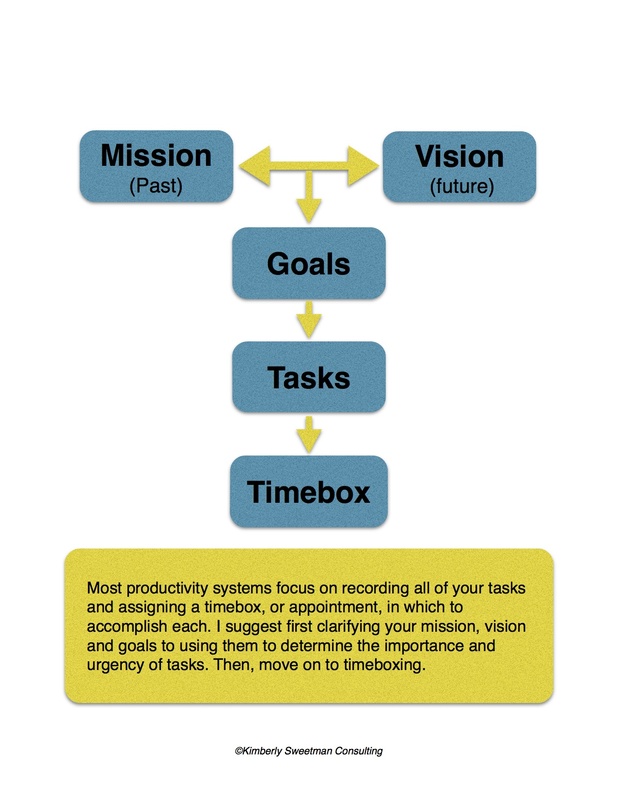 Time management systems all have commonalities. They advise collecting your tasks then dedicating time to do them. There is a certain amount of variety in the way this is described and the flavor of how this happens, which is great because you can pick a system that works for you. 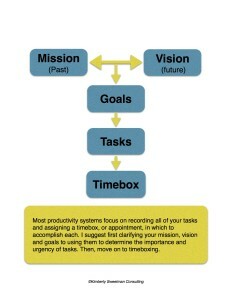 Most time management systems focus on the Goals to tasks to time box part of the diagram. That leaves out the most important part: knowing your strategy. Your personal strategy—your mission—helps to inform your goals. Each goal and task will be easier to accomplish because it will be meaningful to you. What do you do? What product of service do you provide? Why do you do it`? What makes your product or service unique so that a client would choose you to do it? For entrepreneurs, the personal mission is often entwined with business mission. If you work for an organization it can be helpful to write a personal mission as well. Some additional questions might be helpful to personalize your mission. What commitment is necessary to achieve it? Write about an influential person. What positive impact did he or she have? What qualities do you admire most? What qualities did you gain from this person? List 10 things that are most meaningful to you today? What do you live for and love in life? Write yourself a letter: write a letter as your future self. What have you accomplished? Try to encapsulate what is important to you in one word. Focus on that word for a period of time and evaluate how that focus has impacted your work-life. In part 2 of this series I will explain some of the productivity tools that help you to use your mission to improve your productivity. Has clarifying your mission been helpful to you? I'd love to hear why or why not. This is the first in a three part series on productivity. It is based on material I presented at Spark 2015 on June 16, 2015, in Amsterdam, The Netherlands. The conference was targeted at women entrepreneurs but the material is really universal.